These North Carolina-based industry associations are good starting points and information resources for anyone considering starting, or who has recently started, a pepper production operation. Membership in any of these associations will put you in touch with other growers throughout the state and potentially create business opportunities. The N.C. Greenhouse Vegetable Growers’ Association (NCGVGA) consists of growers and suppliers that promote the greenhouse vegetable industry and improve production and marketing practices. Association activities consist of an annual meeting held in October in Raleigh, N.C. coinciding with a farm tour. The N.C. Vegetable Growers’ Association (NCVGA) is a multi-commodity trade organization. Their purpose is to improve and promote the North Carolina vegetable industry. Membership consists of vegetable producers, both large and small, brokers, packers, shippers and allied trade organizations. 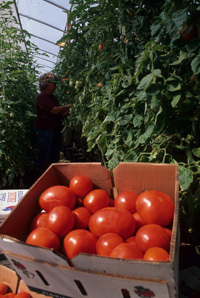 Directory of North Carolina tomato producers (N.C. Farm Fresh). The N.C. Tomato Growers’ Association is a group of growers and suppliers interested in the improvement and promotion of the tomato industry in North Carolina. Articles from Jim Prevor assessing the state of the perishable food industries and analyzing the prospects for the retail and food service venues in which perishable foods are bought and sold. A weekly newspaper covering produce shipping, distribution, marketing and trends in fresh produce, including fruits and vegetables, in North America. This resource provides information on cooling/storage information along with producers and nutritional data related to peppers. • Meet the Tomato Bug!